This Sunday we decided to head to our first car boot sale of 2012, with the weather on our side we knew it was too good of a chance to miss. The lure of a field full of second-hand stalls always outweighs the perils of getting up so early on a weekend. Although car boot season isn’t quite in full swing just yet, there was a good chance of unearthing a bargain or two. The field wasn’t at its usual summer capacity but on occasions like this it gives you that little bit of extra time per stall, meaning you aren’t going to miss or overlook something. This year I am trying to adapt a new attitude to my buying, my main aim is to only buy the stuff I have a real purpose and space for, and restraining on those of the mad whimsical variety. I’ve always had a desire to own a real Steiff bear, that elusive yellow tag and button is a sure sign of a good thing, and when I spotted this tiny fella in a box full of tat, I couldn’t help but feel a little excited. The stallholder didn’t really have much of her stall organized, instead everything was scattered over several boxes on the floor, which may be why he was hidden amongst the other soft toys. He’s a real traditional bear, and the fact he’s small means he doesn’t take up too much room. And of course his Merci sweater ties in perfectly well with my love affair with all things Paris. After a bit of a rummage online, I’ve found these bears usually cost anything between £12-£30. I’m a Ladybird girl through and through, I’ve had Ladybird books in my life for as long as I can remember so I am always on the lookout for ones to add to my collection. The stallholder had a pile of these, I left behind some titles I wasn’t so familiar with, but quickly snapped up the ones that appealed to me the most. They add to my growing collection well, and are in perfect condition, which is quite something considering there age. The stallholder joked that we would have plenty of bedtime reading, but for me it’s the collecting part that attracts me the most and of course these books are so beautifully bind together, each cover so enticing. What a bargain on the bear - that was such a lucky find! I use to have so many of the ladybird books growing up too, loved all the colours of their spines. That bear is such an amazing find and bargain! Amazing bargains - Steiff lady is going to be kicking herself at some point! I always get excited when I see you've done a charity shop or boot sale post because I know you will have found something magical and you definitely did this time! 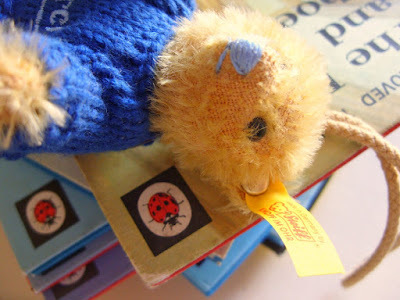 That Steiff bear is such a cutie! In Cheddar there is a teddy bear shop brimming with Steiffs and I can't help but spend about half an hour in there looking at all the little guys I'd love to own! Well done on finding that pile of lady bird books, especially Snow White!! 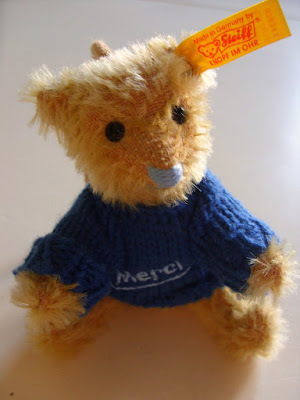 That Steiff bear was such a find and isn't he a cutie? Oh wow, £2.40 for some truly lovely finds. Very well done! I'm going to try dragging myself out of bed for the car boot now that they have started again near me. 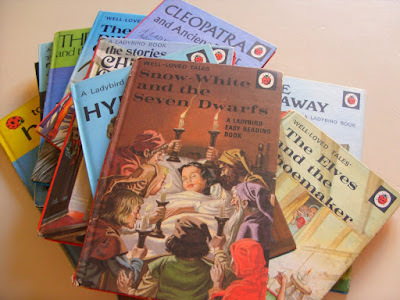 I love those Ladybird books - just looking at the original illustrations transports me right back to my childhood.